I often rail against the typical, formulaic performance evaluation. So, if typical performance evaluation forms aren’t effective for communicating a manager’s desired performance from employees, then what is? Focus on an employee’s strengths. If possible, assign employees to work on tasks and projects that will utilize their strengths. They still must be able to perform the essential job functions, but when there’s a choice steer them to what they do best. Communicate clear expectations to employees. One of the biggest misconceptions managers have is that the employee SHOULD know what to do and how to do it. Or that the employee interpreted the boss’s directions exactly how the boss intended them. Wrong. That’s why we have managers to make sure everyone’s on the same page. Talk to employees about their work daily, weekly, and monthly. It’s a manager’s job to talk to employees about their work, whether things are going well or whether there are problems. To do this, meet with employees at the outset of a new project to clarify your expectations and to get their input; check in with the employee regularly on an on-going basis to see if changes are required; and after the work has been done debrief with the employee to help reflect on what went right, what didn’t turn out so well, and what might be done in the future to achieve the best possible outcome. Put your observations about an employee’s work in writing. Whether an employee excels at the work or whether the employee’s work is shoddy, have a conversation with the employee about their work and put your observations in writing (give a copy to the employee). Letters of commendation, letters of warning, and letters of reprimand should also be placed in the employee’s personnel file. By following these actions, managers are able to create performance feedback that is more effective, timely, and believable than using the typical pre-fab performance evaluation form. Want help planning out what to say to an employee about their performance? Get my Conversation Planner. Have you been “putting up with” a certain employee’s bad conduct or poor performance for a while now in an effort to avoid conflict and be “nice”? It never ceases to amaze me how often managers avoid addressing issues with employees, as though bring up an employee’s poor conduct or performance would be “mean”. Guess what? That’s a manager’s job. when you are avoiding an issue with an employee, it tells me (1) you have limiting beliefs that are holding you back, and/or (2) you don’t know how to set expectations or correct an employee in a professional and respectful way. In reality, avoiding conflict in order to be “nice” or likable is actually “mean”. It creates an enabling, co-dependent relationship that isn’t good for anyone. Reinforcing old or maladaptive behaviors, instead of encouraging new coping strategies or behaviors. When you address issues timely and appropriately through healthy conflict and confrontation, your company, department, work group, business unit, or team will operate much more cohesively. They will become more aware of their strengths and weaknesses and more likely exhibit the behaviors required to work together effectively. However, when you don’t approach conflict in the context of your responsibilities, your workplace becomes coated with the waxy buildup of poor performance and conduct that fuels unvoiced concerns, resentments, passive aggressive behavior, disengaged employees, and gossip. Reflect on how well you are addressing issues rather than avoiding them. Are you really being “nice” or “mean”? Want support for planning out tough conversations, so they are more likely to stay on topic and on track? Get my Conversation Planner today. WANT TO USE THIS ARTICLE IN YOUR NEWSLETTER, BLOG OR WEBSITE? You can, as long as you include this information with it: Beth Strathman works with leaders as they evolve into the leader they are meant to become and learn to maximize the people side of business. Learn more about her at: firebrandconsultingllc.com. Let’s stop pretending. Performance evaluations don’t work. 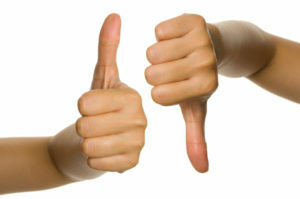 But organizations do them anyway because they think that if they don’t do them, they won’t . . . . well, I’m not sure what organizations think will happen if they stop doing performance evaluations. Maybe they think won’t look like they are “managing” employees. Well, here’s a news flash: performance evaluations don’ t help you manage employees, and by using them, organizations are dodging the real problem: conflict avoidant managers. The standard performance evaluation usually has a grade-card-like section that rates an employee’s ability to do aspects of the job or to exhibit the organization’s expected behavior. Seriously? NOW, you’re grading the employee’s abilities in these areas? Wrong. The time to grade the person was BEFORE you hired him . . . during the selection process. Grading the person’s abilities AFTER you hired him is a bit late. If the person made it through your selection process and landed a job he can’t do well or at all, you don’t need a performance evaluation tool: you need ways to assist you in hiring hire better. At this point, you’re really grading how well your selection process worked. Also, research shows that it’s really difficult for an employee to turn ability deficits into strengths. So what do we think we’re going to accomplish by filling out a grade card on each year? Not a lot. Oh sure, you need to document poor performance to justify remediation or eventual termination, but you can do that in timely memos or letters created after each conversation a manager has with the employee about deficit performance. You see, the real reason organizations create and use forms called performance evaluations is that managers are conflict avoidant. Managers cross their fingers hoping maybe the form will do the managing for them. But the forms don’t do the manager’s work. And that leads to the heart of the matter. Because even if managers have a handy form to communicate their perception of an employee’s performance quality and ability, they don’t do it! They often avoid the tough news anyway! 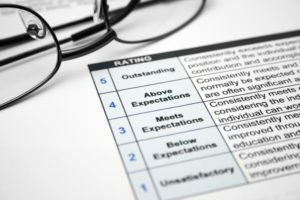 In my HR career, almost 100% of the time I found that each performance evaluation form in an employee’s file showed at least an acceptable if not downright stellar performance. Why? Because most supervisors don’t want to ruffle feathers or rock the boat by subjecting themselves to the negativity that might occur when bad news is delivered to a poor performer. Conflict avoidance. Well, in my book, any manager, who hires the wrong person and doesn’t take timely steps to address performance issues when they occur, ought to experience a little negativity. The issue isn’t about the employee’s performance level or the fact that the company doesn’t use a performance evaluation form. So, whatever shall we do without the performance evaluation? Trade all the time and money used to create, distribute, complete, file and store annual performance evaluations for management training on how to hire the right person in the first place. Oh, and use a hiring managers’ track records of hiring sub-par employees as feedback when talking to THEM about their performance.